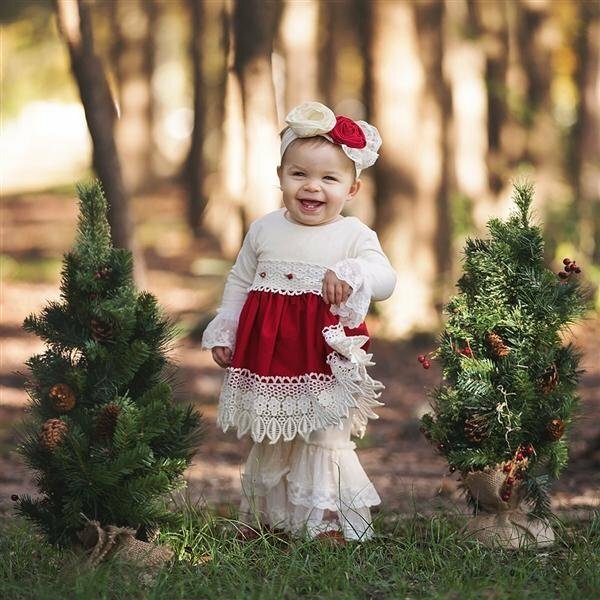 This red and ivory holiday dress from Haute Baby is absolutely gorgeous! 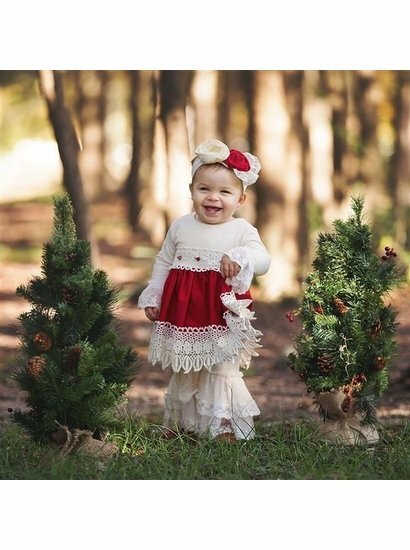 This stunning red and ivory Tis the Season long sleeve dress is the it frock for portraits and Santa photos this season. The beautiful dress is made with quality cotton fabrics and an amazing lace trim waist sash. The red color is deep and rich one. 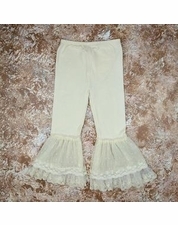 The gorgeous cream versatile pants are sold separately and a must have with their ruffle trims and hem. 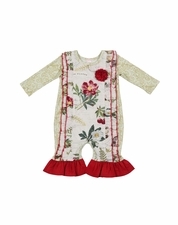 This beautiful Tis the Season holiday dress is available in sizes 6/9m, 12m, 18m, 24m, 2T, 3T, and 4T. Be sure to check out the baby gown, sister dress and headband. All pieces are sold separately. Get your Haute Baby order shipped for free with any order over $75 shipped within the US. This brand runs true to size. For specific questions, feel free to email us at sales@adorableschildren.com or call us at 877-767-8579!! Adorables Children’s Boutique strives to provide you with excellent customer service and quality merchandise. We will gladly accept returns and exchanges within 14 days of purchase on full price merchandise. All returns require a return authorization. Please send an email to: sales@adorableschildren.com requesting to exchange or return an item, noting the reason for the return. Adorables will then reply with a return authorization and instructions for the return. We will make a note in your account of the activity. Once a return authorization is given, items being returned MUST be shipped back to Adorable's within 5 days of receiving the authorization. After the 5 day window, the return authorization will no longer be valid and a store credit will be given. • FULL-PRICE ITEMS: Eligible for return or exchange within 14 days of receipt. • SALE ITEMS: Items purchased at a reduced price or with a discount coupon are only eligible for store credit within 14 days of receipt. • FINAL SALE ITEMS: Items purchased at a total discount of 50% or more, returned without tags or with signs of tag tampering, used/damaged by customer DO NOT qualify for returns or exchanges. • HOLIDAY ITEMS: Become final sale items on the date of the holiday. • FREE SHIPPING ORDERS: Are subject to $6.99 shipping fee if customer returns 50% or more of the order. • EXCHANGE: Does not apply to final sale items. Place a new order for the items you want and send unwanted items back for a full refund. You are welcome to call or email us to assist you with exchanges and the placing of a new order. • PRICE ADJUSTMENTS: Price adjustments are offered only at our discretion and in the form of a store credit to be used on a future purchase. Please allow up to 30 days for processing of returns. If you have not received a refund or store credit within this time, please feel free to contact us at 336-510-4658.